"Sampath Speaking" - the thoughts of an Insurer from Thiruvallikkeni: fraud claim ~ and Insurer's response - Prosecution !! fraud claim ~ and Insurer's response - Prosecution !! Insurance is protection .. .. Insurers indemnify loss or damage arising out of an insured peril – financial protection for a loss arising out of a fortuity – sudden and accidental loss, during the policy period. Every industry needs it – upon consideration, i.e., payment of a small premium, the Insurer offers to protect the subject matter and effect payment when loss or damage occurs. Insurance industry is centuries old and there is something that ails it almost since its origin ~ the insurance frauds. Policy holders seeking unholy and fraudulent means to derive benefit under the policy which includes exaggerating values, manipulating losses, inventing cause of losses and more – all arising out of greed, dishonesty and infidelity of people ! Financial frauds are associated with sophisticated urban areas but are not necessarily restricted to urban areas – it is prevalent in rural areas too. When cyclone struck, there were many claims for damage to building and to trading stock – in many cases, they had inflated the values and taken loans – and some resorted to putting up exaggerated claims with bank statement as proof ! some frauds are occasioned by combination of poor due diligence in writing policies by insurance companies and the organisational efficiencies of criminals in identifying loopholes and manufacturing documents fraudulently, as the World revolves more on documentary establishment. Do you know that Insurers against whom such frauds are made, can pursue criminal action ? ~ further all policy contracts do contain a clause which can be invoked by the Insurers. For example, the Standard Fire & special Perils Policy – condition 8 states : If the claim be in any respect fraudulent, or if any false declaration be made or used in support thereof or if any fraudulent means ordevices are used by the Insured or any one acting on his behalf to obtain any benefit under the Policy or if the loss or damage be occasioned by the wilful act, or with the connivance of the Insured,all benefit under this Policy shall be forfeited. Miles away, the embattled superintendent of Indiana's Elwood Community Schools resigned her position. In a Friday school board meeting came the announcement that Casey Smitherman had stepped down. Smitherman had been arrested recently and charged with insurance and identity fraud after she took a 15-year-old male student to a private clinic for treatment of possible strep throat. At the clinic, she allegedly claimed in insurance paperwork the student was her son.Nothing novel or new, as in a PSU, an employee preferred mediclaim reimbursement when a neighbor woman had been admitted in an hospital for a surgery and she had the same name of his mother-in-law. In another instance, a woman came and screamed in the Office, as the man had taken some other woman on tour and claimed leave travel subsidy .. ! for family travel. In an old movie, Goundamani and Senthil would plan – Senthil to fake his death – and the due would claim fat money of 2 lakh ! from the life insurer. Years later, in 2005, in what is known as John Darwin case, it was faking one’s own death – the first trouble is in the lack of a body. That was tackled in a creative way by Texans Clayton and Molly Daniels in 2005 who proceeded to dig up a corpse from a local cemetery and place it in their burning car. Clayton would then disappear, Molly would collect $110,000 and he would somehow re-appear as her new boyfriend. In truth, their endeavours were very elaborate as she researched into how to burn a body effectively and sought tips on defrauding insurers. There was one gaping flaw in their plan however - the body was that of an 81 year old woman and DNA testing was onlyaction really necessary to confirm what the police already knew. MailOnline now reports that a New Jersey man is facing accusations of insurance fraud after he was caught on video throwing ice onto the floor and faking a slip and fall. 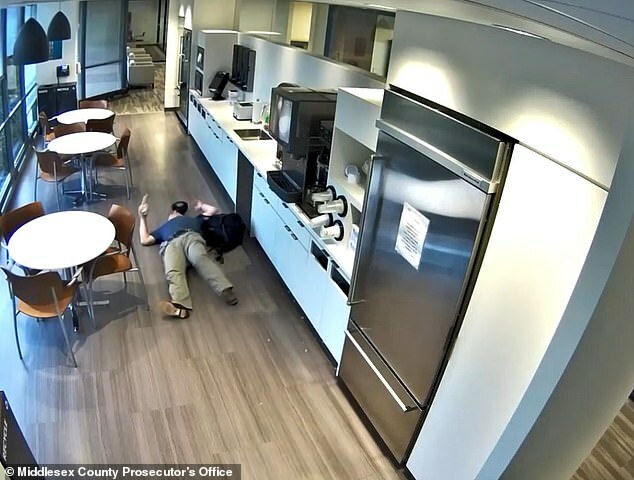 The report states that Alexander Goldinsky, 57, of Randolph, New Jersey, faked a slip but could be seen in a surveillance video from a cafeteria at a Woodbridge, New Jersey. Goldinsky, an independent contractor operating under a company named All Gold Industries, was allegedly subcontracted to do work for the Woodbridge business when the fraud took place.In the video posted on the prosecutor's Facebook page, the 57-year-old can be seen filling a cup with ice from a soda machine in the cafeteria, then walking away a short distance before deliberately spilling the ice onto the floor.He then turns around, takes small steps walking back to where cubes are visible and quickly looks around before gingerly lying down on the floor. Goldinsky then waited on the floor until he was discovered, according to the prosecutor's office. 'Fraudulent claims cost everyone and we will aggressively prosecute those who illegally manipulate the system,' said Carey.He was arrested on January 15 for filing a false insurance claim for the ambulance ride and local hospital treatment for injuries he claimed he sustained in the 'fall.' Goldinsky faces one count of insurance fraud in the third degree and one count of theft by deception in the third degree for the insurance claim. He was released on a summons and he's scheduled to appear in court on February 7. The prosecution of Goldinsky is part of the New Jersey Attorney General’s statewide crackdown on insurance fraud crackdown through the County Prosecutor Insurance Fraud Reimbursement Program.